Click the advancement icons to see the requirements. Troop 101 is chartered by the Dripping Springs United Methodist Church, located at 28900 RR12. 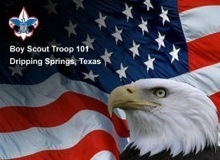 Troop meetings are every Tuesday evening from 7:00 PM to 8:30 PM. The first Tuesday of each month is a PLC (Patrol Leaders' Council). Troop 101 strongly believes in the concept of a Boy-Led Troop so that boys can learn management and life skills by helping run the troop. Of course, adult guidance is needed and sometimes adult help is also needed.